Skye has a cousin, Hiroshi, she has never met. Because Hiroshi lives in Japan, and Skye was born in America. But when Grandfather grows ill, Skye’s Japanese relatives move to America for Grandfather’s treatment. Skye is embarrassed to have Hiroshi in class with her. He can’t speak English well. He’s completely unaware how “uncool” he is acting. And she may need to give up soccer, her passion, to improve her ability to speak Japanese. On the flip side, Hiroshi never wanted to leave Japan. Especially before he had a chance to compete in the traditional kite battle with Grandfather, the contest he’s been looking forward to all his life. He feels like he’ll never fit at the American school, and he resents having to share Grandfather’s attention with his new cousin. Especially when he doesn’t know how much time Grandfather has left. 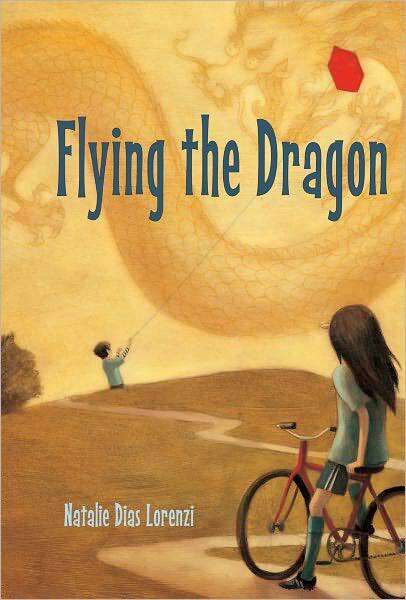 This is a beautifully rendered tale of two children who have to overcome cultural boundaries and selfishness in favor of understanding and forgiveness. Chapters alternate between the two points of view, giving us two sides of the same coin. Ms. Lorenzi does a fantastic job getting us into each child’s head and creating sympathy for each. The problems and misunderstandings that separate them are real everyday predicaments that kids can totally relate to. Who’d want their cousin coming to school in a dorky medical mask to prevent the spread of germs? Who’d want to leave friends to live in a new country where they barely speak the language? But through the rough times, the dragon kite that Grandfather made draws Skye and Hiroshi to Grandfather as well as to each other. Beautiful, thoughtful writing. Highly recommended for ages 9+. Wow! This is the kind of story I love to read and share. Such a terrific idea and plot for a book! I actually thought of you, but figured you’d probably already read it, lol. You’d love it.